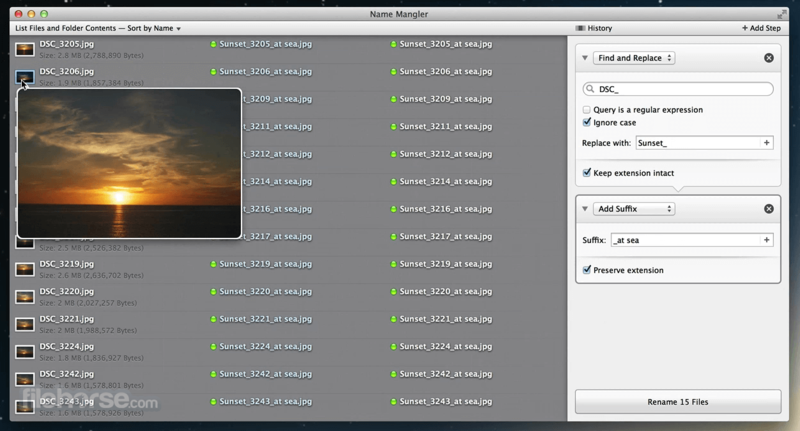 All Name Mangler for Mac wants to do is help you tame your filenames. Whether you're a photographer with thousands of "IMG_" files, or someone who needs to Windows-proof filenames, or someone who works with tons of clients and wants to use filenames to help sort client files properly, Name Mangler will help you safely—and very speedily—rename your files. Name Mangler makes most renaming tasks as easy as choosing your desired action from a pop-up menu, then configuring a few options for the chosen action. For example, the Change Case action offers the ability to change filenames to lowercase, to uppercase, or to title case. Name Mangler is really fast. 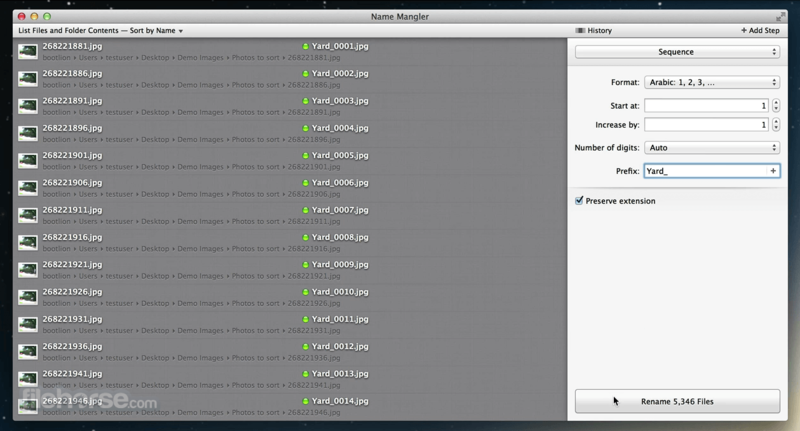 Watch the progress bar at right to see just how fast—that's 5,000 files being renamed in just over three seconds. As fast as that is, some operations may go even faster. Need to massage your files in more than one way? 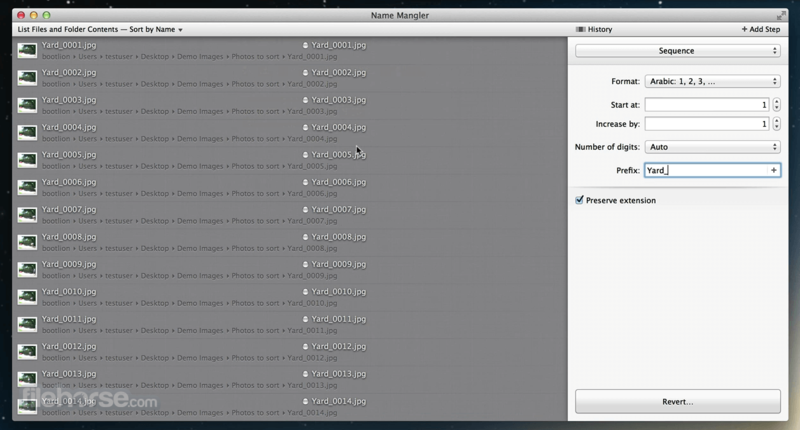 No need to run Name Mangler multiple times on the same files. Just add another step—or ten—to your action, and Name Mangler will do everything for you, all in one pass. Need access to your files' metadata? 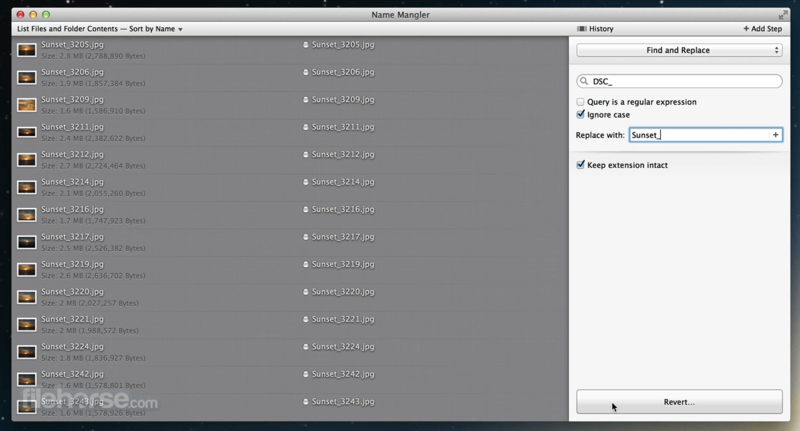 No problem; Name Mangler contains over 150 metadata fields available for use in your renaming actions. Certain numeric and date metadata values can even be formatted to your specifications. Name Mangler's elephant-like memory means you can easily access any previously-used renaming action, and reuse it with a couple of mouse clicks. By default, Name Mangler remembers your last 50 renaming actions, but you can increase or decrease this value (or set it to unlimited or off) in the preferences. Presets let you store your often-used renaming actions in a menu for fast future access. You can load and run as saved, or modify after loading to do something slightly different. Programmers and technical types can use Advanced mode to create mini programs that run within Name Mangler, solving even the most complex of renaming tasks. These programs can be saved for easy reuse, too. Note: 5 launches trial version. Requires 64-bit processor.